London’s most ambitious and innovative development projects have been celebrated at the 2017 London Planning Awards. The night’s winners include the Peckham Coal Line, a grassroots project creating a new community park from a disused coal line; the Deptford Project, which has transformed a railway goods yard into a vibrant space for local businesses, cafes and homes; and the Francis Crick Institute, a pioneering partnership that brings six of the world’s leading biomedical research organisations – the Medial Research Council, Cancer Research UK, the Wellcome Trust, UCL, Imperial College London and King’s College London - under one roof. 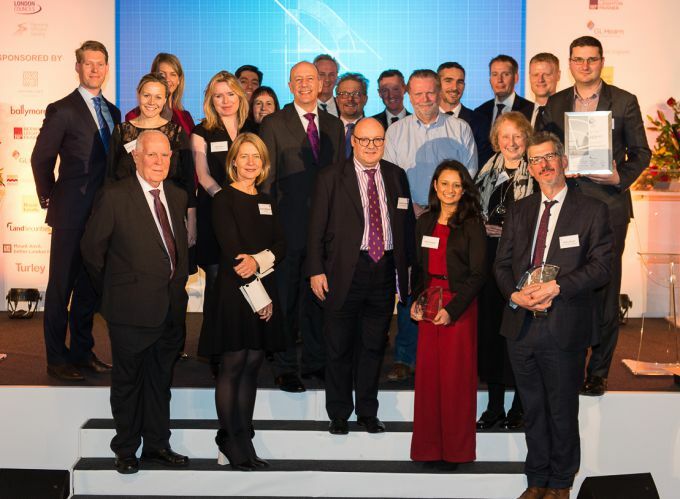 Now in its 14th year, the London Planning Awards are organised by London First, in partnership with the Mayor of London, London Councils, the Planning Officers Society and the Royal Town Planning Institute. Peckham Coal Line, presented by 927 crowdfunders - a group of pioneering supporters, local residents, business and London wide organisations including Southwark Council, GLA, Sustrans and Network Rail. A fantastic example of a locally driven project that is bringing a coal line back into use as a new space for community and cultural activity. Demonstrating how 3D technology can transform the understanding of London’s urban environment and deliver better outcomes for planning, designing and building in the city. 14 truly local businesses have taken space in the historic railway arches. With Deptford’s heritage at its heart, this scheme has regenerated the town centre and delivered 132 new homes and new commercial and retail spaces. A new neighbourhood providing 1700 homes, new public spaces and public art exhibits and a new home for both the London Film School and English National Ballet. For its cutting edge and cost effective approach to addressing the housing crisis for homeless families, high residential and overall design quality. A pioneering partnership between six of the world’s leading biomedical research organisations - the Medical Research Council, Cancer Research UK, the Wellcome Trust, University College London, Imperial College London and King’s College London – all brought together in one building. The institute aims to respond to fast-moving changes in the medical sciences by facilitating collaboration and accelerating the translation of scientific research from the laboratory to hospitals and pharmacies. For its innovative reuse of a former basement carpark to provide accessible and high quality workspace. A new area of high quality landscaped public space in London’s West End. It provides a haven for local residents, visitors and workers to sit, dwell and take time out from the bustling streets around. A real hidden gem. A landmark project that forms part of the Crown Estate’s vision to transform Regent Street. Quadrant 3 delivered high quality public realm, with sensitive restoration of listed building facades, high quality offices and vibrant retail and food and drink spaces. For its strong heritage-led approach, transformational effect it has had on this long neglected piece of London and catalysing influence on the wider regeneration works to King Cross. This project transformed Walthamstow Town centre. It introduced a new cinema to Walthamstow alongside new food and drink spaces, creating a thriving daytime and new night-time destination. A truly successful mixed use scheme with housing and landscaped amenity space. Southwark has demonstrated innovative approaches to both plan making and decision taking, particularly in the delivery of 11,000 new council homes for the borough. The awards were presented at a ceremony at City Hall on 27 February 2017.